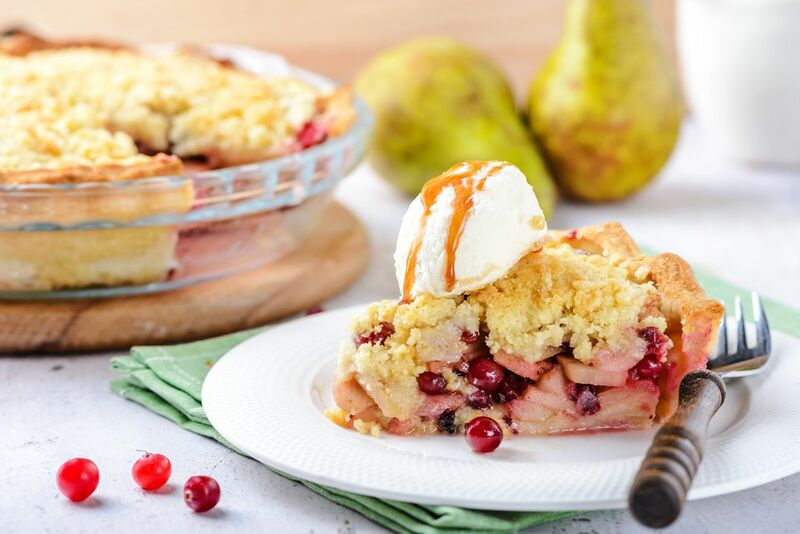 A simple vegan cranberry and pear pie recipe using little more than cranberries, pears, maple syrup and sugar. The recipe includes a crumbly sweet topping, but this pie can also be used with a lattice-top or a double-crust (don't forget to poke holes! ), or even open, with no topping at all. Pair this pie with a scoop of vanilla bean ice cream and a drizzle of caramel sauce. Gather the ingredients and preheat the oven to 375 F.
Place the cranberries in a saucepan with the apple cider, sugar, and maple syrup. Simmer, stirring frequently, for 3 to 4 minutes, just until cranberries start to "pop." Remove cranberries from the heat and allow to cool. Gently toss the pears with the cranberries and add sprinkle with cinnamon and nutmeg until evenly coated. Prepare a topping by crumbling together the remaining sugar, flour and vegan margarine, mixing until crumbly. You may need to add a little more or less flour. Bake for 10 minutes, then reduce the heat to 325 F, and bake for an additional 25 to 30 minutes, until crumb topping is lightly browned and the pears are soft. Pie will be very hot, so allow to cool before serving.